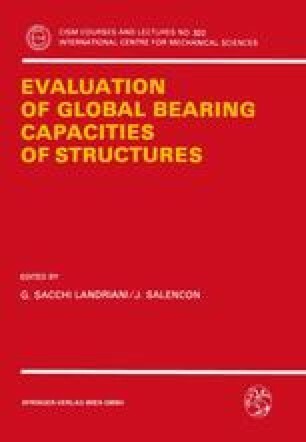 The considerable development of various reinforcement techniques in soil mechanics over the last few decades, has made it necessary to devise both reliable and efficient methods for analysing the stability of such composite soil structures. The Yield Design theory is perfectly well suited to undertaking such a task, since it provides a comprehensive mechanical framework. The purpose of this contribution is to present two different approaches to the problem. The first part is devoted to the so-called mixed modelling approach, where the reinforcements are perceived as structural elements (rods, beams, plates etc. )embedded in the soil treated as a 3-D continuum. It is shown in particular how the kinematic method of yield design can be implemented, leading to practical developments such as a computer code for the design of reinforced soil retaining structures. A complementary (and sometimes alternative) point of view is presented in the second part. It originates from the intuitive idea that, in many cases, the composite reinforced soil may be perceived as a homogeneous material on the scale of the structure. The Yield Design theory associated with a homogenization technique makes it then possible to derive explicit expressions for the macroscopic strength criterion of such reinforced soils, on the basis of which a design method is implemented. Possible extensions of this approach to some particular kinds of reinforcement are briefly outlined.